Diammonium hydrogen phosphate is a yeast nutrient used in bread making. 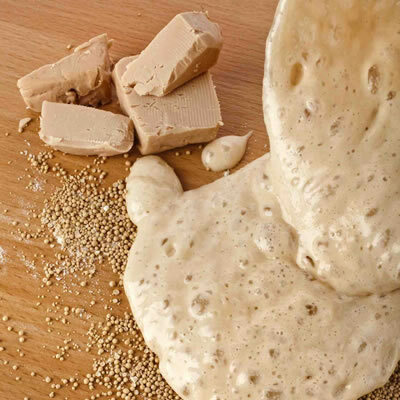 In the first stages of dough fermentation, it is essential to provide micronutrients for yeast cells. The goal is to enhance the growth of yeast cells (biomass) rather than pursue the rapid production of primary metabolic products (e.g., carbon dioxide and alcohol). It should be stored along with non-allergenic powdered ingredients. It usually sells in a 12.5 kg bag. As a micro ingredient, it can be incorporated into the formulation by premixing with process water. SIGMA-ALDRICH. 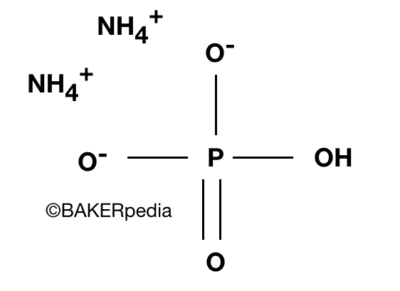 “Ammonium Phosphate Dibasic – Product Specification.”, https://www.sigmaaldrich.com/catalog/substance/ammoniumphosphatedibasic13206778328011?lang=en&region=CO&attrlist=Solubility. Accessed 9 March 2018. Bamforth, C.W. Food, Fermentation and Micro-organisms, Blackwell Publishing Ltd, 2005, pp. 99, 115. Doores, S. “Acidulants.” Food Additives Data Book, 2nd ed., Blackwell Publishing Ltd., 2011, pp. 36–46. U.S. Food and Drug Administration. “21 CFR 184 – Direct Food Substances Affirmed as Generally Recognized as Safe.” 1 April 2017, https://www.accessdata.fda.gov/scripts/cdrh/cfdocs/cfcfr/CFRSearch.cfm?CFRPart=184.